After monopolising the top spot in the BT 500 ranking for nine years, Mukesh Ambani's Reliance Industries Ltd (RIL) had to make way for Tata Consultancy Services (TCS) this year. RIL, famed for delivering phenomenal shareholder returns year after year, is no longer India's most valuable company, based on its average market capitalisation between April 1 and September 30 used in the BT 500 rankings. TCS'S average market cap in the April-September period was Rs 2.44 trillion versus RIL'S Rs 2.42 trillion (one trillion equals 100,000 crore). This is not surprising, given the challenges RIL has had to face across its businesses, new and old, in recent years. The largest business, crude refining, has borne the brunt of global competition. In petrochemicals, low liquefied natural gas prices have shrunk its margin. In oil and gas, exploration and production (E&P) operations have been hit by a sharp fall in output and adverse policy decisions. City gas distribution has run into hurdles, while the retail arm is still in the red six years on. Telecom is yet to take off and financial services arm is work in progress. Together, these problems have taken a toll on RIL'S bottomline. Net profit as a share of total income has plunged from 13.37 per cent in 2007/08 to 5.79 per cent in 2011/12. Profit has dropped year-onyear for four straight quarters now to the July-September period. These declines have led to a sharp erosion in the company's value. RIL'S share price, which closed at Rs 1,065 on November 26, 2009 on the Bombay Stock Exchange (BSE), when it made a 1:1 bonus issue, has shed 24.4 per cent in value and was at Rs 805 on October 17 this year. The Sensex rose 10.4 per cent in this period. In an effort to shore up investor sentiment, the company announced a Rs 10,440 crore share buyback offer on January 20 this year. TCS'S share price and market capitalisation, in comparison, have shot up 86 per cent between November 2009 and now. Despite these setbacks, RIL'S daily market cap has climbed back to No. 1 in recent days. On October 17, its market cap was Rs 2.6 trillion, marginally ahead of TCS'S Rs 2.5 trillion. RIL's refining margin is expected to improve following the closure of some global refineries. The company is still ahead of others on a few parameters in the BT 500 ranking. It is No. 1 in terms of net worth, No.1 in the oil and gas sector in terms of market capitalisation, and it has the largest cash reserves. The group's biggest business is refining crude to make products such as petrol and diesel. One of the metrics used to measure success in this business is the gross refining margin (GRM), which is the difference between the price of crude oil and the total value of petroleum products derived from it. In 2007/08, RIL'S refining margin was $15 per barrel, which was $7.4 higher than the benchmark Singapore GRM. 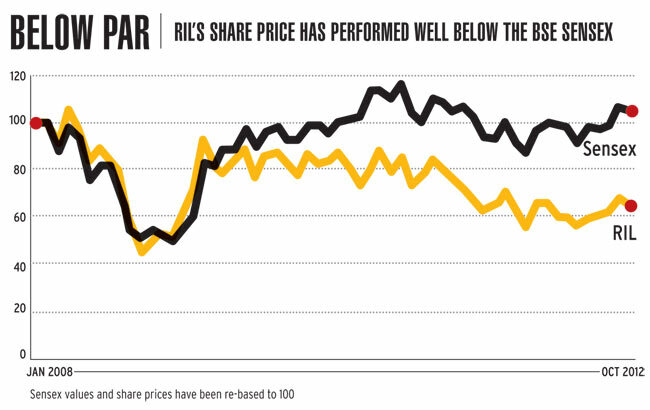 In 2011/12, RIL's margin had come down to $8.6 per barrel, just $0.3 more than the benchmark. Analysts say the increase in the number of complex refineries, primarily in the Middle East and Asia, is one of the primary reasons for the narrowing margin. Since complex refineries process heavy crude, the demand for it has gone up, driving up its price, and affecting RIL'S profit margin. But things are improving. RIL'S GRM was at $9.5 per barrel in the July-September quarter, and it is expected to benefit from the closure of some complex crude refineries globally. The petrochemicals business, RIL's second biggest, also saw its margin shrink over the last couple of years, from 15.5 per cent in 2009/10 to 11.1 per cent in 2011/12. A petrochemical plant can be gas-based or naphtha-based. The majority of RIL'S petrochemical production is naphtha-based. "The low cost of gas in the Middle East and the sharp decline in gas prices in the US (with access to more shale gas reserves there) has resulted in the cost of producing ethylene from naphtha being twice as high as producing it from gas," says Dayanand Mittal, analyst with Ambit Capital, in an October 3 report. Ethylene is a hydrocarbon with wide application in a number of industries. RIL is confident of improving its margin in the business. "We are confident that India will continue to have a significant amount of growth and this growth will push demand for both polyester and polymers, giving us a better margin," said an RIL spokesperson in an email response. "The primary problems for RIL in the last three to four years have been its E&P (exploration and production) business and its deteriorating relationship with the government," says Sudeep Anand, analyst with IDBI Capital Market Services. In 2011, RIL sold stakes in 21 oil and gas blocks to British Petroleum for $7.2 billion to ramp up exploration and distribute gas in the country. Neither business is gathering steam. 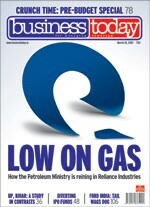 RIL is said to have scaled down its investment in gas fields in the KG-D6 block by almost $3 billion to $5.92 billion. 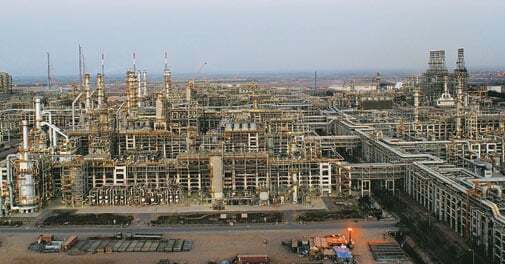 Recently, the RIL-BP combine relinquished nine of its 21 blocks owing to poor prospects. The KG-D6 block was originally projected to yield 80 million metric standard cubic metres per day (mmscmd) of gas but the current yield is only 22 mmscmd. RIL blames the tough geology for this sharp variation. In June, Niko Resources, RIL'S Canadian partner in the KG-D6 block, slashed the original estimation of 11.3 trillion cubic feet (TCF) of gas reserves to 1.93 TCF. The Petroleum Ministry has refused to clear the budget for RIL'S capital expenditure in KG-D6 unless the company agrees to an audit by the Comptroller and Auditor General. In October, the ministry cancelled licences given to Ambani's Reliance Gas Transportation Infrastructure (RGTIL) in 2007/08 to lay four natural gas pipelines, because of repeated delays. Relogistics Infrastructure Ltd (Relog), a subsidiary of RGTIL, received licences to lay pipelines on four stretches: Kakinada-Basudebpur-Howrah, Kakinada-Chennai, Chennai-Bangalore-Mangalore, and Chennai-Tuticorin. Work on these pipelines has not started. Relog cited uncertainty over availability of gas for not meeting the three-year timeline specified in the 2007 authorisation. Ambani does not have much to show in his new businesses either. In 2006, the company earmarked an investment of Rs 25,000 crore for its organised retail business. But so far, it has invested only a third of that in the business. The retail arm is still in the red, with revenues of Rs 7,600 crore in 2011/12, and losses pegged at Rs 390 crore. Ambani, though, appears unperturbed. During this year's annual general meeting, he said that RIL was looking at retail sales of Rs 40,000-50,000 crore in three to four years. An analyst with a domestic brokerage says that apart from high realty costs, RIL'S retail operations also suffered because of a highly centralised management. "There were issues with RIL'S management bandwidth in the beginning, but they have addressed it." RIL today has the diversity of businesses it did before the group was divided between Ambani and his younger brother Anil in 2005. However, the top management has not changed much. The core management remains in the hands of Ambani, Manoj Modi, a senior executive, and Ambani's relatives Nikhil and Hital Meswani, who are executive directors. The only other high-profile executives are P.M.S. Prasad, who heads the E&P and refining businesses, and Chief Financial Officer Alok Agarwal. While the group has earmarked an investment of Rs 1 trillion for its various businesses in the next five years to double operating profit, Ambani's biggest bet in the coming years will be telecom. He was the brain behind Reliance Communications, but had to let go of it as part of the split with Anil, Chairman of the Reliance Group (until recently known as the Reliance Anil Dhirubhai Ambani Group). With the brothers doing away with a no-compete clause in 2010, Ambani acquired 95 per cent of Infotel Broadband gaining rights to use pan-India spectrum in the broadband wireless access auction, for Rs 4,800 crore. RIL is expected to roll out 4G (fourth generation) services next year with low-cost tablets and attractive data plans. IDBI'S Anand agrees that telecom is the next big business for Reliance, but says it will not make a big impact on numbers for another three to four years. Ambit's Mittal concurs. "We do not expect the retail and telecom businesses to contribute more than eight to ten per cent of RIL'S financial year 2017 EBITDA," he notes in his report. EBITDA is earnings before interest, taxes, depreciation and amortisation. Of the group's Rs 1 trillion investment in the next five years, 40 per cent will be in retail and telecom. Some feel RIL may have gone too far into unrelated areas by buying a stake in the P.R.S. Oberoi-owned EIH Ltd, and structuring a complex deal between its trust and unlisted companies of the Raghav Bahl-run Network 18 group. Still, the Network 18 deal could give Ambani control over 17 news channels. And some much-needed content for his 4G plans. As for financial services, RIL is yet to prove its mettle. Its March 2011 joint venture with DE Shaw, to offer a range of financial services, has not made much headway. While its challenges are many, RIL still has many things going for it. With a topline of Rs 3.46 trillion in 2011/12, it is the biggest Indian private company by revenues. Its cash pile of Rs 79,159 crore is also the biggest. How RIL puts those reserves to use among its core and new businesses is the biggest question on investors' minds. As the analyst with the domestic brokerage puts it: "They (investors) are not sure what they are buying into when they buy RIL shares." Providing the answer maybe Ambani's biggest challenge. Oil & Natural Gas Corporation Ltd (ONGC) was behind Coal India Ltd in the market capitalisation standings for much of the early part of this year. However, India's sovereign ratings downgrade affected Coal India more than ONGC. A comparison of the BT 500 numbers for ONGC in 2011 and 2012 shows that its average market capitalisation dipped from Rs 2.38 trillion to Rs 2.32 trillion. However, its profits moved up from Rs 18,924 crore in 2010/11 to Rs 25,122.9 crore in 2011/12. The world's largest coal miner had climbed, for a while, to the top of the daily market capitalisation league table last year. However, despite getting more coal blocks, its production is projected to remain flat at 435 million tonnes. What still makes this company lucrative is its revenueprofit ratio. In financial year 2011/12, its revenues were Rs 9,624.3 crore while profit was at Rs 8,065.1 crore. Getting 114 more mines, and enjoying a monopoly over coal production, consolidates its value. Despite the economic slowdown, ITC Ltd's market capitalisation has continued to increase. Often rated as a "defensive stock", it rose from Rs 1.5 trillion to Rs 1.9 trillion. If it continues to advance at this pace, ITC could soon become the top company in the BT 500 list. But with the market showing some signs of improvement, the company may not find it easy to increase its market capitalisation by a similar margin next year.